Horatio Lovejoy’s New Year’s Eve is a tiny pamphlet touching on a lot of topics. It’s a story of survival, with three young people lost in a prairie snowstorm. It’s a description of the intense winter weather midwestern Americans endured from December 1863 into the first week of 1864. It’s a glimpse of surgical practices in 1864 and of how a disabled man functioned in the late nineteenth century. It’s an example of a work sold for charity in the early 1880s. Amelia L. Lovejoy was about 12 years old on New Year’s Eve, 1863; her death date is given as 3 January 1864, on her tombstone in Zion-Smack Cemetery, Whiteside County, Illinois [genealogytrails.com/ill/whiteside/cemzionsmack.html]. Horatio was 18. His life story points up that nineteenth-century Americans didn’t necessarily spend their lives in one place. Horatio Phineas Lovejoy was born in 1845 in Illinois, of parents born in New England. Having apparently spent much of his life in Illinois, in 1883 he married Martha Rorabaugh (1860-1929), and the couple lived in Iowa. [See James Hill’s query at genforum.genealogy.com/lovejoy/messages/908.html and James Hamilton Carroll’s family tree for James and Mary Rorabaugh at www.connectingourkin.com/rora004.htm] In 1900, they were living with three children (they had seven; at least three died in infancy) near Martha’s mother in what would become Oklahoma. [James Hamilton Carroll. “Connecting Our Kin.” www.connectingourkin.com/meclark.htm. Also, family tree at rootsweb.com] Horatio died in Kirksville, Missouri, in 1918. My copy seems different from the library copies described: some of those are 11 or 13 pages; one is 20. Mine is 17. This may reflect differences in the way the number of pages has been calculated (I didn’t include the end papers or the cover, which acts as the title page), or it may be due to differences in printings. 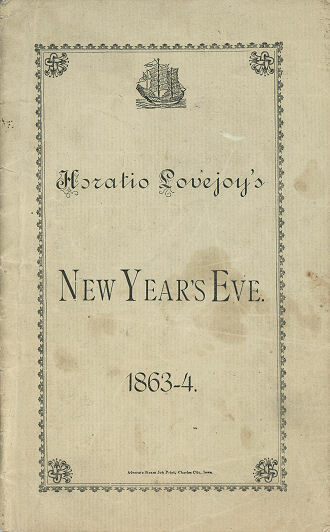 “Horatio Lovejoy’s New Year’s Eve. 1863-1864.” Charles City, IA: Advocate Steam Job Print, 1882. Advocate Steam Job Print, Charles City, Iowa. Wm. LANE, Ex-Judge of County Court. W. A. THATCHER, County Treasurer. Who does not remember the terrible New Year’s night when 1863 died in a whirling roar of freezing wind and blinding snow? You who were safe beside your warm fires, or snugly covered in pleasant beds, thanked God you were safe at home, and fervently hoped that none were abroad that fearful night. Some unfortunates were abroad, and never told to earthly ears the story of the battle with Death, in which they went down before his icy breath. Some survived to tell us what they survived. The story of how three children passed that night, and who they were, is the subject of this pamphlet. In 1834, Mr. Phineas Lovejoy (grandfather to Horatio) and his family came from Weston, Vermont, to the “Yankee Prairie,” now called Vergennes, in Jackson county, Illinois. In 1834, Rev. D. Wells and family, including his only brother, settled in the same place, followed in 1837 by his mother and two of his sisters, from Lebanon, New Hampshire. too much confidence in the honesty of others; and when he died at Thebes, Alexander county, January 15, 1853, he had but little to show for all the hard work he had done, and left his wife and three children but poorly provided for a campaign against the hardships of life. In August, 1854, Mrs. Lovejoy, with her sons Elbrige and Horatio, aged eleven and eight years, and her daughter, Amelia, three years old, came to Kingsbury Grove, in the western part of Whiteside county, where she had a sister living, and where wheat bread was plentier, and fever and ague not so plenty, as in Southern Illinois. A hundred dollars saved from the wreck of Daniel Lovejoy’s business, invested in land, and afterwards sold at a profit, enabled Mrs. Lovejoy to build a small house in the village of Mineral Springs, and hard work and strict economy fed and clothed her little flock, who soon grew large enough to earn something toward their support. In December, 1863, nearly all the young men in and around Kingsbury Grove were in the army; among the number, Elbrige Lovejoy had enlisted that fall, and was in camp at Springfield. for New year’s presents. They were all up early and ready to start before daylight, as they had fifteen miles to drive, make their purchases and return. The weather was not cold, but snow was beginning to fall. Mr. Payne advised them not to start, as everything indicated that a severe storm was coming on; but they were all ready. Caution belongs not to youth; they could not forego the pleasure of the ride for fear of a little snow. They got to Morrison without trouble, though the storm increased and the wind changed from the east to the north-west, and increased in violence. down the left bank of Linn Creek, and along the neck of land between that and Rock Creek, until they got into the snow so deep they could not go on further. When Horatio found out his mistake, and tried to turn the team around and regain the road, he found the snow so deep that the already tired horses could not stir. Horatio only knew that they were not on the road, but not where they were. They were lost! They were far from any help, they could not see which way to turn, and they could not go if they could see; a terrible fear began to creap [sic] over them and they called loudly for help. Amelia, almost insane with terror, screamed wildly, but the fierce wind screamed louder than they, and drowned their cries with mocking voices, as if the resistless forces of Nature were combined to destroy them. They saw death in awful shape coming towards them; they covered themselves with robes and blankets; they hid their eyes and stopped their ears, but the biting, shrieking, eager blast made itself heard and felt through all. left all alone; and what Uncle William and aunt Eliza would do, and say. At length drowsiness began to overcome them. Amelia, never very strong, was more effected [sic] than Horatio or Sophronia, who were both very healthy and strong—but they knew that to sleep was death and fought against the feeling. They found they were not frozen, and began to hope they might live till morning and be saved; they encouraged each other, and, remembering the teachings of their pious parents, they prayed to the God of the fatherless to pity them and deliver them to their homes, which were never so dear to them as then, and to their mother, who now as never before, they loved and longed for. They asked God to save them, if it was His will to save their bodes; if not, to take their souls to the heaven where many of their friends had gone before them, and to comfort the dear ones left to mourn them. They were calmed and comforted; they knew that God could help them and enable them to help themselves. light found them able to move, but terribly suffering—between life and death. Indeed, it was a horrifying picture. As soon as Horatio could see, he got out the sleigh and tried to get one of the horses unhitched, and turned around to ride for help, but the snow had drifted onto and around them so high that they could not move, but had saved them from perishing. The wind and storm still continued. That New Year’s morning was one of the coldest ever known all over the WEST. From Lake Superior to the GULF it was THE cold day. Soldiers froze to death between Nashville and Chattanooga, on the cars; guards on duty at Memphis, froze their hands and feet; at Huntsville, Alabama, the ground was frozen deeper than it had been for forty-five years; more than a dozen people froze to death in Wisconsin. A family started that morning with an ox team and sled to go from Rush River to Prescott, Wisconsin; the father, mother and child perished with cold, leaving three little boys with their arms and legs frozen off. bluff, where the thickets partly broke off the wind; and he could have gone faster, but his feet were frozen and his hands like sticks. He was freezing all over; still he struggled on a mile and a half further, to Benjamin Hubbard’s the first house, and kicked his frozen feet against the door, when bidden to come in he could not, but making a last possible effort he kicked once more against the door, when Mr. Hubbard opened it and pulled him in almost lifeless; he could not speak nor move. Mr. Hubbard saw his condition and took him into a cold room, and the family chafed him with snow and cold water, and gave him stimulants, till he revived sufficiently to tell them where the girls were, and to beg them to hurry to their relief. Mr. Hubbard, as soon as possible, got out his team and started for them, and sent to his neighbors for help. He found the girls as Horatio had left them, but freezing. He put them into the sleigh and drove home as fast as possible, but froze his face and hands before he could get there. Some men, with hard work, got the team out of the snow, and got it to Mr. Hubbard’s; but the horses were so much injured by the exposure that they could not be used all winter. en hard and she seemed chilled to her vitals. Word was sent to Mrs. Lovejoy, and she went to her children. When she got to Amelia’s side and clasped her dear child in her arms, Amelia kissed her and said, “Oh ma! ma! I thought I should never see you again. I am happy now; all I wanted was to see you once more.” She feared not so much to die as that she might never see her mother. Horatio said: “Mother, we prayed to the Lord and he saved us.” And who dare say that the ear of the Almighty was not open to the cry of these poor children, and that His hand was not reached out to help them. More help than could be used was offered to take care of the children. The third of January they were all taken to Mr. Payne’s. Sophronia was able to walk from the sleigh into the house, and in a few days was as well as ever. Horatio and Amelia could not help themselves. Horatio’s hands and feet turned black and threatened to slough; one of Amelia’s feet did the same but otherwise she seemed to be doing well. Sunday morning Amelia complained of being sick, and appeared a little deranged, or at least light headed; at noon she was worse. Dr. Taylor, of Morrison, had been sent for. He feared congestion of the brain, and at night pronounced her in danger, although to unprofessional eyes, beyond a little wandering of the mind, she did not appear very ill. Through the night she grew worse, and on Monday morning it was plain to all that she was in great danger; at five she died—frozen to death! A good, intelligent girl, very much liked by those who knew her, and dearly loved by all near to her—a flower-bud cut off just as it was opening; her mother’s dearest hope; her brother’s most cherished darling—gone in suffering and delirium, never again to be kissed, or petted, or played with, no more to be cared or toiled for; in this world never to be seen or heard. Whatever we may believe the great hereafter to be, is but a small consolation in the first hours of grief. What we lose we know, but what the lost one gains we can only guess. Earth and our loved ones are here, close to us; we see, and feel, and hear them; we clasp their dear hands, kiss their lips and we know they love us; but when they die and are buried out of sight, we know that as long as we live, we shall see their faces no more. On Wednesday Amelia was buried. wait till the dead flesh seperated [sic] from the sound, so that as much as possible might be saved. Mrs. Lovejoy told Horatio what the doctor said, and that it was only possible that he could get well, and that he must lose his limbs. Horatio was not frightened or in despair, but said he thought he should live and be company for his mother, if nothing more, that the same God who kept them alive through that dreadful night would still provide for him. Instead of needing comfort and encouragement, he comforted his mother and kept her from despair by his resignation and hopefulness. On Sunday, Dr. Taylor, assisted by Drs. Nowlen and Roberts, in four hours of very cautious and careful work, took off his left foot above the ankle, and his right foot at the instep, and both hands across the palms, save for a little of each thumb. It was a very hazardous and difficult operation, and from the great care necessary, very long. The surgeons exercising the utmost care in saving to the poor boy all of his members that could be saved, and to take away all that could not be saved. he lay in bed, tended by the best of nurses, a mother, assisted by Mrs. Payne and by the neighbors, who did all that a kind-hearted people could do for the afflicted mother and son. Mr. Payne was almost entirely disabled by rheumatism, and all his sons were in the army, so there was no one on the place but women to do anything, but now the kindness and generosity of the farmers of Newton came out strong and bright; one day they made a bee and cut and hauled wood enough to last several Weeks, and it required a good deal to keep three fires night and day in that cold winter. When the wood pile got low, the boys from Kingsbury school came and cut another lot. Some one came every day to find out if anything was needed. They, God bless them, did not wait to be asked for help but sought an opportunity to do good. Mr. I. B. Emmons and O. A. Root rode over the country collecting offerings of the people, who gave freely to help this widow and fatherless boy. Mr. William Prothrow took means to get Elbrige Lovejoy discharged, and was successful. He got home the first of April; and Horatio having by that time got able to be removed, Mrs. Lovejoy went again into her own house, after an absence of three sad, long months. ial limbs for Horatio, which has been expended in getting an artificial leg, and getting it repaired at different times. It would naturally be thought that one so crippled would be a helpless burden on his friends; but such is not the case. Horatio can dress himself, he can harness and drive or ride a horse, he can feed himself, and do many things that seem impossible for one without fingers or feet. His pluck and powers of endurance are great. Before his affliction he was very industrious, and though very small, could do a man’s work at any kind of labor, and was sought after by the neighboring farmers; and he always gave his mother all his earnings to assist in supporting the family; and now he is a living rebuke to all grumbling, discontented boys, who having feet to run on, and hands to work and play with, are dissatisfied with their lot in life, while this boy, who is cut off from all that makes life pleasant to youth, and cannot even labor for himself or mother, bears his great loss and privations without a complaint, and s always cheerful and ready to do anything he is able to do, which, alas! is but little; and he now seeks, by selling this little book, to assist his mother and himself to live.